We’d love your help. Let us know what’s wrong with this preview of Basketball Mom by Ginny Baird. A boy wishes on a shooting star to become a basketball great, but the magical stardust falls on his unwitting single mother instead. A cute, light and funny, G-rated romantic comedy, and a happy, heartwarming read. To ask other readers questions about Basketball Mom, please sign up. What a cute, fun book! Tess is a wonderful mom! I loved the way she was always thinking of Jake and putting him first. Picturing her soaring above the rim as she used her new abilities made me smile. She and Colin made a great couple. He is caring and giving, and I loved watching him with Dakota. I loved the way things ended, and wish I could keep watching their story unfold. The story was perfect for it's length, though. I loved it!! I received a complimentary copy of the book, which I voluntari What a cute, fun book! Tess is a wonderful mom! I loved the way she was always thinking of Jake and putting him first. Picturing her soaring above the rim as she used her new abilities made me smile. She and Colin made a great couple. He is caring and giving, and I loved watching him with Dakota. I loved the way things ended, and wish I could keep watching their story unfold. The story was perfect for it's length, though. I loved it!! 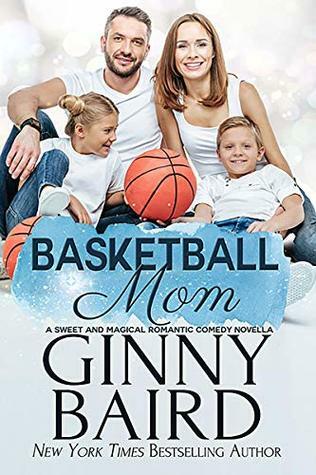 Basketball Mom: A Sweet and Magical Romantic Comedy Novella is everything you would expect from a Ginny Baird tale. It is sweet, fun and romantic. I loved Tess and Colin’s story. The were great together. I give Basketball Mom: A Sweet and Magical Romantic Comedy Novella five plus stars. It is most definitely not one to be missed. I highly recommend it. While reading Basketball Mom, I felt like I was reading a modern day fairy tale or maybe watching an old live action Disney movie. It's a cute fantasy tale that fits perfectly into a vacation schedule or maybe waiting for a child at basketball practice! Tess is a single mom and her son, Jake, loves basketball and wants desperately to be good at it. Colin is the new high school basketball coach and is raising his young daughter, Dakota, alone. He has just moved across the street from Tess and Jak While reading Basketball Mom, I felt like I was reading a modern day fairy tale or maybe watching an old live action Disney movie. It's a cute fantasy tale that fits perfectly into a vacation schedule or maybe waiting for a child at basketball practice! Colin is the new high school basketball coach and is raising his young daughter, Dakota, alone. He has just moved across the street from Tess and Jake. When Dakota shows off her basketball skills to Jake, he asks how she's so good. In reply, she tells him about wishing on a shooting star. When Jake sees a shooting star later that night, he wishes with all his might, never dreaming that his mom would accidentally intercept his wish! What follows is completely outlandish and crazy like Herbie the Love Bug or The Absent Minded Professor movies but yet fun and entertaining at the same time. The romance is pretty quick, but that's to be expected with the novella length. The only thing that really didn't make sense to me is that the children basketball players are only 2nd and 3rd grade. Events in the later chapters are difficult to believe when considering this detail. This was such a whimsical and fun read. The concept was so original. I thought it was a sweet and endearing story. Tess is a single mom struggling to get her own column at the paper. Her seven year old son Jake just wants to make the basketball team. One wish on a shooting star changes their lives. Colin Wade is the single dad of Dakota. She's the best thing to ever happen to him. And a crack shot on the basketball court. So when she starts helping Jake of course he notices Jake's beautiful mom. S This was such a whimsical and fun read. The concept was so original. I thought it was a sweet and endearing story. A lively, light-hearted romance develops between neighbors in a small town. The twist in this book comes from a large dose of magic. With a wish upon a star, an ordinary mom turns into a basketball super star. As the book progresses, the plot explores how children cope with being left behind by death or second marriages and how the parents who are at home struggle to parent supportively. This book provided an in-depth approach to strengthening children at risk for developing self esteem issues. A lively, light-hearted romance develops between neighbors in a small town. The twist in this book comes from a large dose of magic. With a wish upon a star, an ordinary mom turns into a basketball super star. As the book progresses, the plot explores how children cope with being left behind by death or second marriages and how the parents who are at home struggle to parent supportively. This book provided an in-depth approach to strengthening children at risk for developing self esteem issues. The romantic relationship in the book was key to building a safe space for the children and happiness for all four major characters. I really enjoyed this book and would highly recommend it. I really in enjoyed reading this book! It is a sweet & charming story. a single mom, & her son, Jake. Jake & Dakota, are the same age. trouble. Dakota is doing great. So she suggests Jake to wish upon a shooting star. That was everything went wonky. is hard to de I really in enjoyed reading this book! Do you ever wish on a falling or shooting star and hope your wish comes true. Jake does, he wishes on a falling star that he will become a great basketball player. However, something happens and his Mom becomes one instead of him. Jake gets mad at her for stealing his wishes and dreams. This cute novella will make you laugh and is a joy to read. I certainly enjoyed it and think Mom deserved her little bit of magic. A quick fun novella that will have you laughing. As the Disney saying goes, "When you wish upon a star, your dreams come true." Only this wish went a little haywire. Jake is still struggling to play basketball and his new neighbor has no problem showing him some new moves. Tess wants nothing to do with this wish and Colin is trying to help navigate this new sensation. It is also bringing these two families close. Tess is a single mom of a seven year old Jake. He is obsessed with becoming the best basketball player ever so that he can make the school team. New neighbour Dakota tells him the magic of a shooting star can make his wish come true. Colin is Dakota's dad and the high school basketball coach. He's ready to move on from the loss of his wife's death. When Jake's wish decides to give Tess super basketball skills, Colin's interest is definitely piqued! A light, fun, slightly magical read. I received Tess is a single mom of a seven year old Jake. He is obsessed with becoming the best basketball player ever so that he can make the school team. New neighbour Dakota tells him the magic of a shooting star can make his wish come true. As a novella it keep me turning pages and was easy to follow. Tess is a single mom raising her son Jake who loves basketball. Colin a single dad raising his daughter Dakota. Colin is an English teacher and the new basketball coach for Covesville high school. A perfectly paced story pulling you in. This is a magical read about a wish gone wrong. Or did it? A really sweet, fun, family oriented, romance filled read. Sometimes we don't get what we wish for but something way better than we ever dreamed.